In playing 51 games at Notre Dame, predominantly in the middle of the Irish defense, Manti Te’o rarely found himself far from center stage. Today will be no different at Lucas Oil Stadium. Te’o will be the focus of attention by a healthy percentage of the 800-plus credentialed media at the combine. It will be anything but off-Broadway, or off-Capitol Street in the case of Indianapolis. There have been interview attractions through the years. Before players were put into a podium structure, they were backed into corners of hotel areas while media pounced. In 1998, Peyton Manning was up against wall in the restaurant of the Holiday Inn Crowne Center as NFL scribes worked him over. Manning handled it with his typical aplomb for 20 minutes. Last year, Andrew Luck and Robert Griffin III held structured availabilities that drew masses. Today, Te’o may set a record. Te’o will cut through the crowd to address questions likely not too related to his measurables. It will be necessary for the personal matter he has endured over the past few weeks. Players from Notre Dame are famous for their poise. Te’o should play his own game. He has done well to this point in a difficult situation, and observers should expect nothing different today. Personnel evaluators will have their chances with him in private interviews. Many, such as John Elway, were prominent collegians, too. They remember the challenges of youth, and they now are charged with bringing young adults into a very professional, competitive business. 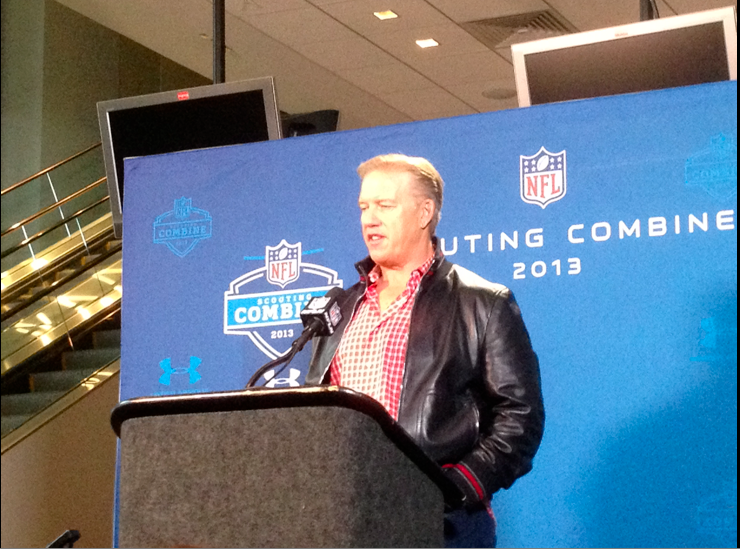 “I just want to talk to him,” said Elway. “Personally, I don’t get caught up in everything that is swirling around him. I’m looking forward to sitting down and talking to him. Today will not be the first time Te’o has been in this public position, and it won’t be his last. Former teammate Tyler Eifert drew less notice on Friday when he met with combine media, and he feels Te’o is holding up well.